Koftas are relatively easy to prepare at home and make a lower-fat alternative to a traditional burger. 2. Grill or barbecue the koftas for 8-10 minutes, turning occasionally, until browned. Take care as they will be quite delicate until they’re cooked through. 3. Arrange the spinach, carrots and cucumber on plates. 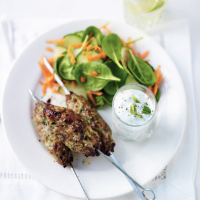 Stir the remaining mint into the yogurt and serve with the koftas and mixed salad.